I gave my wife, Susan, a sip, and she said “lemon wheat.” I can see that, too. The citrus is prominent, and I believe the rye adds some cloudiness and body. As far as the saison yeast goes, I’m not sure it is evident. If it is, it blends in with the fruitiness that the hops bring to the glass, which would be a good thing. The fermentation temperature reached 78˚F (25.5˚C) or so — not a stretch for many saison strains. I would recommend this recipe, and I hope to brew it again. If I would tweak anything, it would be to raise the bittering hops a little bit. The beer could stand to have more bite, but not much. It is a great summer brew. Too bad there’s not much summer left. However, I don’t think it will last until the leaves change. Sounds quite delicious. 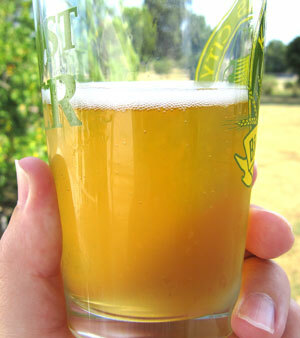 I am surprised the Saison yeast and rye is overpowered by the hops, both are so distinct that they should shine through. I would expect some nice earthy/grassiness from the yeast with a nice dry bite from the rye. In either case it sounds delicious. We just did a wheat and rye light bodied stout. The rye is so well highlighted, great for the summer months when you want a stout but not the heaviness. Cheers! Sounds really interesting, James. I have suddenly found myself very interested in Saisons following the latest Zymurgy with the Pumpkin Saison recipe (currently in primary). Will probably put this in the plan for a late spring 2014 brew session to have it (or a version) ready for next summer.